NIAGARA FALLS, ON – A brewery and restaurant with a mission of “building community through great craft beer and food” is now open in Niagara Falls, Ontario. 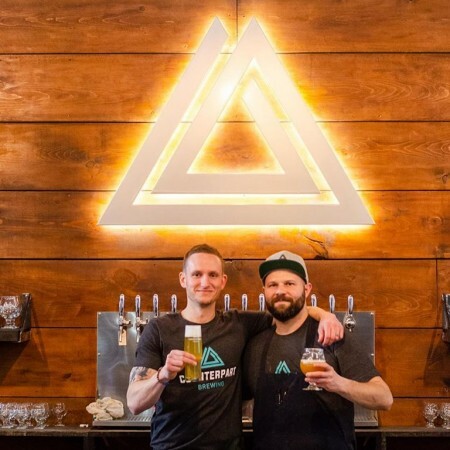 Counterpart Brewing was founded by Joe Sartor and Greg Gnys, two Niagara Region natives who met when both were working in Vancouver and were encouraged by family members in Niagara to move back and partner on a food and drink project. The resulting establishment opened last month, and features a full-service bar and kitchen with a food program overseen by Gnys – a veteran chef with experience at several top tier restaurants in Niagara, England, and British Columbia – and beer developed by head brewer Jon McMillan. Some of the beers available by the glass and in growlers at Counterpart since opening have included Hindsight Stout (6.2% abv), In Bloom Saison (5.5% abv), Here Goes Nothing Kolsch (5.2% abv), and Dreamwork Hazy IPA (7.1% abv). Counterpart Brewing is located at 3659 Stanley Ave. in Niagara Falls, and is open from 11:00 AM to 9:00 PM on Monday to Thursday, and 11:00 AM to 11:00 PM on Friday and Saturday. For more details, see the Counterpart Brewing Facebook page.